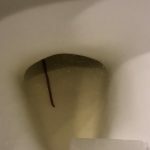 We can say with confidence that this isn’t an earthworm or a bloodworm, which are two of the most common creatures readers find in their toilets. 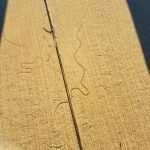 Earthworms have similarly shaped bodies to the worm our reader found, but have brown, segmented bodies. Bloodworms, or midge fly larvae, thrive in polluted waters but are tiny and red, not grey. 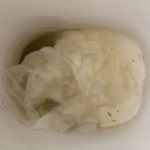 Another type of organism found regularly in bathrooms and toilets are drain fly larvae. 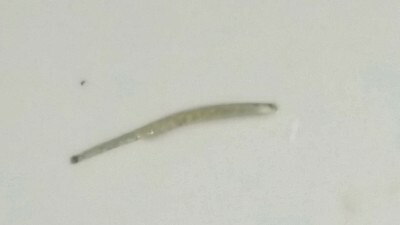 Drain fly larvae have tiny, translucent/black bodies covered in microscopic hairs. While the specimen in the photo isn’t a perfect match, in another situation we might guess that a drain fly larva is what our reader had discovered. 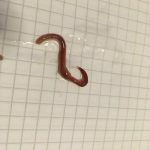 Since our reader explicitly said this worm came from a bowel movement, this is a special situation. 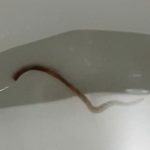 Often when readers find worm-like organisms in their toilets they aren’t sure if the creatures came from their bodies or if they were already in their toilets. In this situation, our reader wasn’t asking where the creature came from, she already knew. Because of this, we encourage our reader to see a doctor immediately. We aren’t medical professionals, and therefore are unable to diagnose readers or give medical advice of any kind. Due to the nature of how she discovered this creature, it seems like our reader might be dealing with a parasite. We recommend that our reader make an appointment with her doctor and bring in the worm if she hasn’t already disposed of it. 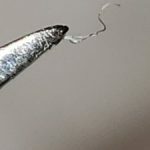 A doctor will be able to weigh in on this situation and hopefully provide the help our reader might need! 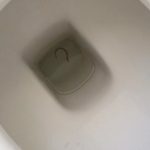 To wrap up, since our reader found a worm in her bowel movement, we think it might be a parasite. However, since we aren’t licensed professionals, we can’t provide medical advice of any kind, and therefore encourage her to see a doctor ASAP. 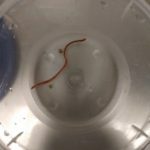 Our reader found a worm in her bowel movement, so we think it might be a parasite. However, since we aren't licensed professionals, we can't provide medical advice of any kind, and therefore encourage her to see a doctor ASAP.